Try this place if you haven’t already! This is an excellent addition to East Harlem’s somewhat limited dining out scene. East Harlem is home to an infinite amount of Taqueria’s. My personal favorite was always El Paso. They had three locations. Then, they closed the one closest to my house on 116th btwn 2nd and 3rd Ave. I learend of the closing when my husband and I tried to go brunch there and were greeted by a sign stating that they were closed but would be re-opening as a new restaurant. I was devastated. This was my go-to brunch spot, where they served bottom-less mimosas with brunch. One of the reasons, I loved El Paso so much was their excellent service. I never sat for more than a couple minutes, and at bottomless brunch the servers always refilled my mimosa before I was even finished. I never had to ask for water, or for a refill of my water. The food was always prompt and hot. I could go on. 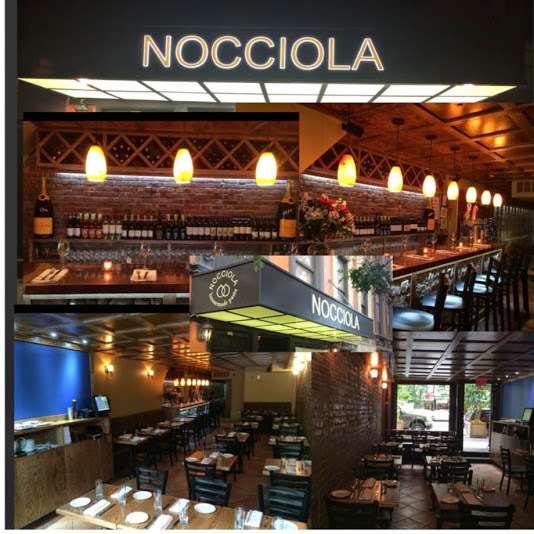 Then, I learned that Nocciola was displaying the art work of a friend and local artist. I decided to check it out at his art opening there. The atmosphere was nice, just as described on their website, rustic and Italian. I only had wine that night, but I was thrilled to see the faces of the former El Paso staff still working there. After, learning that they were now displaying local artists work and that the restaurant was run by the same people that ran El Paso, my husband and I decided to make this our New Year’s eve meal. We have a tradition where we go out to eat on New Year’s Eve, then come home to watch the ball drop with our dogs. Also, it was quite fitting since on New Year’s Day of 2014 we went to El Paso to start the new year with my favorite brunch. My meal was excellent. I got the Agnolotti (butternut squash ravioli, hazelnuts and sage) and the Penne Pommodoro (Tomato Ragu, fresh tomatoes, basil). The pasta was home-made and the ingredients fresh. Overall, the meal was light enough that I didn’t feel gross, but was still full afterwards. My husband got the steak special (which I can’t find on their regular menu), which, was amay-zing. Seriously. It was stupid good. I’m glad I re-found my favorite East Harlem restaurant, just in a shiny new Italian form.